Opinion Outpost is a site where you can supposedly earn money by taking paid surveys. 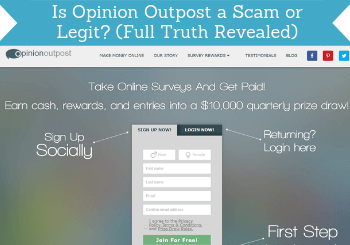 But is Opinion Outpost a scam or legit? With so many survey sites out there, this is important to know, so you do not end up wasting your time. In this Opinion Outpost review you will get all the details about what this platform really offers, how it works, and if it really works, so you know exactly what you are getting into if you decide to join. What is Opinion Outpost and what does the site offer? Opinion Outpost is owned by the big market research company Survey Sampling International, LLC. It has existed since 1977 and is a reputable company that is behind many legit survey sites. This does however not mean Opinion Outpost will necessarily be a good option for you, and there are shared experiences about this platform online, as I will show you later. But let’s first go over what opportunities you get as a member of Opinion Outpost. Opinion Outpost is a very simple site, as it does not have a lot of different options. This makes it easy to use. The only way you can earn here is by taking paid surveys. The way Opinion Outpost works is that you just simply have to sign up (see link later in this review). Once you have joined, you do not have to do much to check, if there are available surveys. You just have to check your email, as you will get an invitation, when there is a new survey available for you. It is not the site that will give you the most survey opportunities, but you should still receive a decent amount. Exactly how many depends on the country you live in and your profile. Be aware that as on most other survey sites, you will not qualify for all the surveys you are offered, so do not be discouraged if you get a survey you do not qualify for. It happens to us all. On Opinion Outpost it might happen more often than on other sites, but you should still get a fair amount of surveys you can complete. Opinion Outpost has one other way you can potentially earn some really good money. It has a quarterly lottery/sweepstake for all members. When you take surveys, you will get entries into the lottery. You will also get entries for surveys you end up not qualifying for, so that is a nice small consolation prize. The reward in this lottery is very nice. The exact amount depends on the country you live in, but they are in general high. On Opinion Outpost UK the draw for example has a quarterly prize of £5,000, in Canada, there is one winner every quarter that gets $1,250, and in the US the rewards for the quarterly draw is a total of $10,000. The quarterly prize draw has great prizes. So if you are lucky, you can really get a really nice prize. This is of course just an extra chance. As in any lottery, the chances of winning are not big, and there are a lot of participants. So you should not join Opinion Outpost just to participate in the draw. But it is a nice extra chance, if you like taking the surveys on the site. 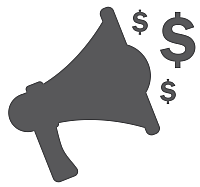 One thing is to know you can get paid to take surveys, but how does opinion outpost pay you? The type of rewards are in my opinion a very important aspect, when you need to find the right survey sites for you. You need to make sure, you can get paid in a way that suits you. Opinion Outpost actually has some really good methods. You can for example get paid through PayPal, Amazon gift cards, and other gift cards. The exact types of rewards and gift cards depend on your country, but PayPal is for example available in all countries, and this is a great and easy way to get your rewards in cash. When you take surveys on Opinion Outpost, you get paid in points. These points can then be exchanged into one of the rewards. When you can request a payout depends on the reward you choose, but if you want to get Amazon gift cards, you can get it already, when you have earned $5, but if you want to get paid through PayPal, you have to wait until you have earned $10/£5. This is a fairly low payout threshold, which is great. 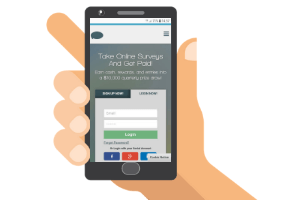 With the amounts of surveys you get on Opinion Outpost, it can however still take some time to get there compared to the quickest paying survey sites, where you can often earn enough to a payout the same day you join. Opinion Outpost is not the survey site with the most opportunities. It can definitely give you some extra chances to earn by sharing your opinion, but if you want to earn a decent amount like this, you should also join some of the top paying survey sites, as Opinion Outpost alone will not give you enough opportunities. But as an extra site, it can be worth considering. I love when it is possible to use a survey site on my mobile, as it is a great way to get access to taking them whenever it fits into my schedule. Opinion Outpost does not offer an app, which would have made it easier. But you can still use Opinion Outpost on your mobile. The website is optimized for mobile, so it looks decent on most screens. Also, you do not actually need to go to the platform to take the surveys, as you will receive invitations via email. So as long as you can access your email from your mobile, you can take Opinion Outpost surveys from it. Be aware that not all surveys will be optimized for mobile, so in some cases, you might have to scroll in and out a bit. Who can join Opinion Outpost? Opinion Outpost is only available in select countries. In some countries, it is also known by a different name, but it is still Opinion Outpost. In Germany, the site is for example called MeninungsOrt. The countries where it is known as Opinion Outpost are the UK, USA, and Canada. You can check if it is available in your country by clicking the join button later in this article. If you do not live in one of the countries where the panel is currently recruiting new members, you can instead check out the best survey sites in your country here. It is always important to know, if you can get support on a survey site. Hopefully you will never need it, but sometimes there can be problems with an account, and it is good to know, you have a way to get technical help. There is a helpdesk at Opinion Outpost. On the website you can submit a question, and on the US website there is even a phone number, you can call. You can also find Opinion Outpost on Facebook and send them a message here. From what I can see there, the Facebook staff is very fast at getting back to people, and respond to all comments about concerns there. Example of how quickly Opinion Outpost replies on Facebook. This is a good sign, as fast responses say a lot about a company. However, the customer support seems to not always be so great, and there are quite a lot of complaints about this. Most Opinion Outpost complaints I have seen and heard are about people getting locked out of their account and not being able to get help from the support staff. This is of course not a good sign, and unfortunately there is quite a lot of poor reviews on Trustpilot about issues like this. There are quite a few complaints about Opinion Outpost. Some of these complaints seem to not have been resolved, whereas the example above shows someone who ended up getting help. From looking at how Opinion Outpost respond on Facebook it does seem like they are getting back to people and do care about it, but it also seems like many people are frustrated about the site. To be fair, there are also several positive Opinion Outpost reviews. Example of one of the positive Opinion Outpost reviews. This is just to give you some perspective and give you some other opinions and experiences as well to take into consideration when deciding to join Opinion Outpost or not. Overall it does however seem like Opinion Outpost does have support, but it seems to be slow at times and not always good at resolving problems. If you have any either positive or negative experiences yourself, I would love to hear from you in a comment below. Opinion Outpost has both positive and negative sides. So let’s sum up the pros and cons, so you can get a better overview, before deciding whether you want to join or not. Overall there is a legit company behind Opinion Outpost, and it has existed for years. It might not have the most opportunities to earn, but it can still be worth considering as an extra site. It has great payout methods and a low payout threshold, and with a little patience, you can earn some nice extra money here. However, I would suggest also to check out the best paying survey sites in your country, and join some of these in addition, as Opinion Outpost alone will not give you enough opportunities, if you want the chance to earn a decent amount of money on paid surveys. How to join Opinion Outpost? After you have signed up, you have to confirm your email address to get access and to start receiving surveys. If you have any comments, questions, or have any experiences with Opinion Outpost yourself, I would love to hear from you in a comment below. Opinion Outpost has both positive and negative sides. Overall it is an opportunity to earn a little extra cash, if you live in the UK, US, or Canada. But it can take a little patience, and to get the best chances to earn, it is a good idea to also join other additional survey sites with more opportunities. Consent: By signing up for the survey course & newsletter, I accept the privacy Learn more. Thanks for this very informative review, Mikael. It seems to me that this (and completing surveys in general) could be a good opportunity for those who have the interest and the time to do the work and who are interested in making some bucks. I don’t get the impression that the whole survey-taking thing is likely to be more than a quick way to pick up a few coins, however. Maybe I’m wrong, but I do wonder. What’s the point of selling your time for pennies? If you join the right sites, paid surveys can give you some nice extra cash. But you are right that it is not a way to make a living. One thing people often overlook when it comes to paid surveys is that it is also a great way to have your opinion heard. The surveys are used by companies and governments, so you will have your voice heard about important topics, and personally I think this is a great thing about the surveys as well.